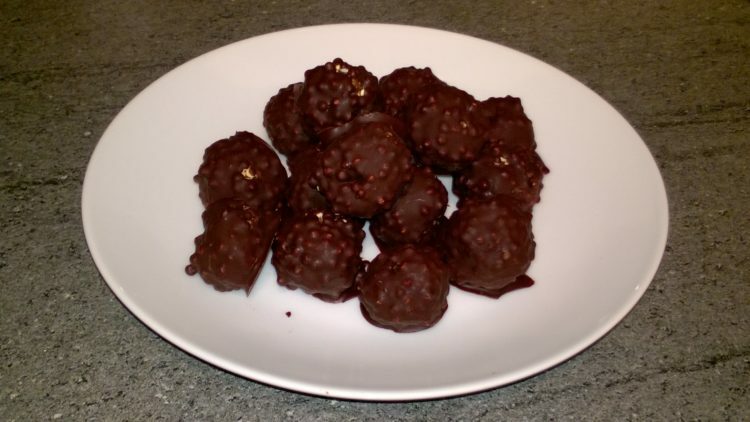 These raw chocolate beauty balls contain ingredients that are good for your body as well as your hair and skin. It is nice a treat to have and know they are benefiting you. 1 Melt the 80g of chocolate in a glass bowl over a saucepan of water, on a medium heat, make sure the water is not touching the bottom of the bowl. When the chocolate has melted set aside. 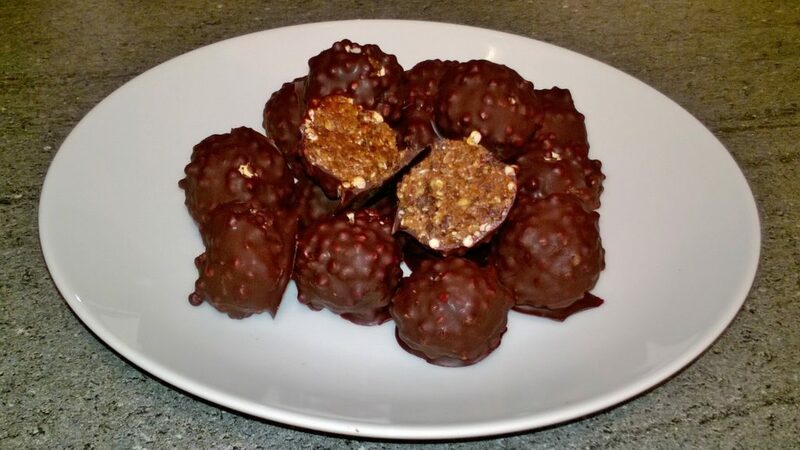 2 Place the dates, oats, chocolate pieces, cinnamon, golden linseed, brown linseed, and water in a food processor and blitz until it all comes to together. 3 When it has all come together empty on to a chopping board and mould into a large ball. 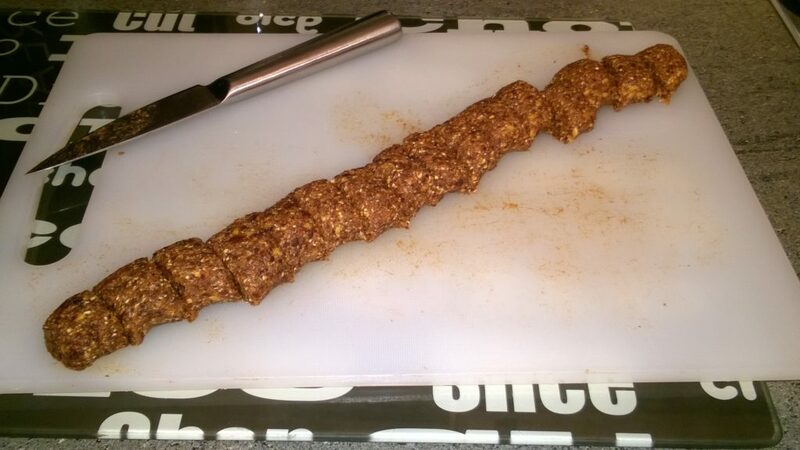 4 Then roll the ball on the board applying pressure into a long sausage. 5 Cut in half and cut the 2 halves in, then halve them and so on until you have 16 pieces. 6 Roll each of the 16 pieces into a ball to get 16 balls. 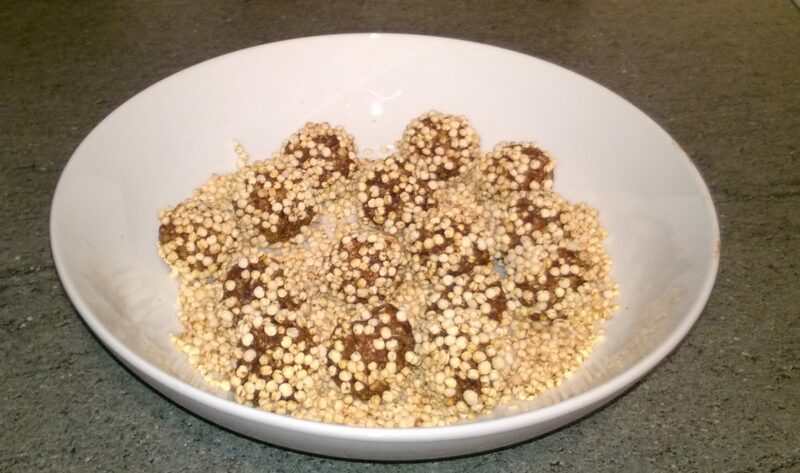 7 Place the popped quinoa in a bowl and roll the balls in to the popped quinoa until it is covered. 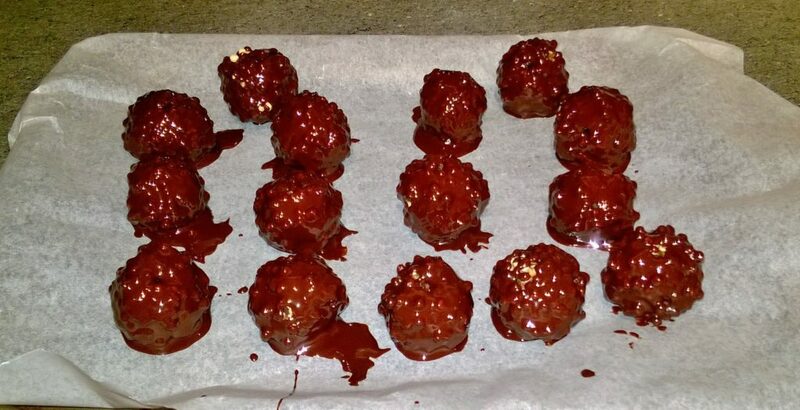 8 With a metal skewer pick up the ball and dip it into the melted chocolate until it is covered in chocolate then place on a baking tray covered with greaseproof paper. Repeat the process until the entire balls are done. 9 Then place the tray the freezer for 10 mins. 10 Then remove from the freezer place in a seal bag or container and store in the fridge and enjoy at your leisure. Dark Chocolate with a least 70% coco helps keep a healthy heart relaxes blood vessels so reduces blood pressure and lowers the stress hormones which break down collagen in the skin and improves brain function. It contains flavonoids an anti-oxidant that protects your skin UV damage, fight free radicals and improves blood flow to the skin. Dates keep your skin hydrated and retain moisture levels, heals damaged skin cell, gives you stronger healthier hair. It is rich in vitamin-B, vitamin-A, calcium and fibre. Oats are great for your complexion and collagen in the skin. It controls hypertension, has post-menopausal benefits, lowers cholesterol and helps keeps your heart healthy. It contains calcium, iron, magnesium, zinc, vitamin-E and vitamin-K.
Cinnamon lowers blood sugar levels, lowers cholesterol, it has anti-fungal, anti-bacterial, anti-viral, anti-carcinogenic and anti-inflammatory properties. It is great for having a clear skin, slows the signs of aging and stimulates hair growth. Golden and brown linseed also known as flaxseed are an excellent source of vitamin-E which is important for healthy skin. It also contains selenium, manganese, potassium, iron, calcium and magnesium.